John had a tough time finding loads his Remington Model 700 didn’t like! Love at first sight: John found an early Thompson/Center Contender with a 10" octagon barrel chambered for .222 Remington. In the year 1950 firearms had not yet become a great interest to me because I was only 11 years old but I could name the roster of every baseball team. However, things were about to change. I was smack dab in the middle of the Classic Age of Firearms and 1950 had been a banner year. Smith & Wesson brought out the Chiefs Special .38, and three versions of the 1950 Target chambered in .44 Special, .45 Auto Rim, and the updated version of the .38/44 Heavy Duty. All these guns and more were waiting for me when I started accumulating a lifetime of sixguns, semi-automatics and rifles in 1956. One of those firearms from 1950 came from Remington. The first rimless centerfire .22 caliber cartridge arrived that year in the Model 722 bolt action. That round was the .222 Remington and it would soon be affectionately known as the Triple Deuce. I had one of the early ones. This was the good news. The bad news was I was still a teenager and not all that smart. I let mine get away and it would be decades before I ever had another .222 Remington. In fact, it would take over 50 years. Fortunately, I walked into Buckhorn Gun one day and there on the rack was an early .222 Remington, not a model 722 but a Model 700. I wasted no time writing my check. However, that was only the beginning. I went back a few weeks later and what should I find but an early Thompson/Center Contender with a 10" octagon barrel chambered in .222 Remington. I was in the Triple Deuce business again in a big way. As handloaders we often come up with a “new to us” firearm and then proceed to try to find some really accurate loads. It did not work this way with that Remington 700. It was difficult to not find an accurate load; nearly everything worked. I am by no means a rifleman. I don’t practice breath control; I just shoot but the Triple Deuce is very forgiving. At least it seems that way as 100-yard groups well under 1" seem to be normal. My components of choice are 50- and 55-gr. bullets from Hornady, Sierra and Speer loaded with Hodgdon’s CFE and an old favorite, H322, ignited with CCI #400 Small Rifle Primers. I was rewarded with three-shot 100 yard groups of 5/8" using Hornady’s 50-gr. SP over 21.5 grains of H322 for 3,070 fps and Sierra’s 55 SBT using one-half grain less of powder for just under 3,000 fps. It gets better — 1/2" groups came from Sierra’s 55 SBT and Speer’s 52-gr. HP using 21.0 grains of H322 with muzzle velocities over 3,000 fps. By now you’d think I wouldn’t try any other powder. However, going to 25.5 grains of CFE has yielded my most accurate load so far. With this charge Hornady’s 50-gr., V-Max clocks out just under 3,100 fps with a 3/8" group for three shots at 100 yards. 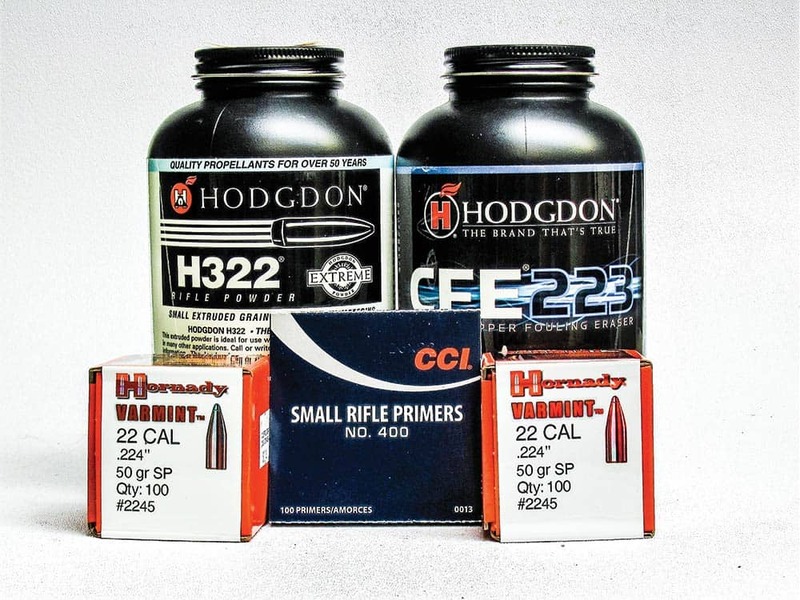 John’s powders of choice for loading the Triple Deuce are Hodgdon’s H322 and CFE. Left to right: The .222 Remington came first followed by the .222 Remington Magnum and the .223 Remington. Switching to the 10" Contender resulted in muzzle velocities from 500-600 fps less. Shooting at 45 yards I was rewarded with 3-shot groups of 1" with Hornady’s 50-gr. V-Max over 24.2 grains of CFE (2,215 fps) and 21.5 grains of H322 (2,520 fps). The same accuracy was also delivered by Speer’s 52-gr. HP with 21.0 grains of H322 at just under 2,500 fps. My most accurate load in the short barrel was Hornady’s 50-gr. SP over 21.5 grains of H322 (2,400 fps) that put three shots well under 1". Beginning in 1950 the .222 Remington was the varmint and small game cartridge by which all others to come later would be judged. The .22-250 was more powerful but much noisier and harder on barrels. 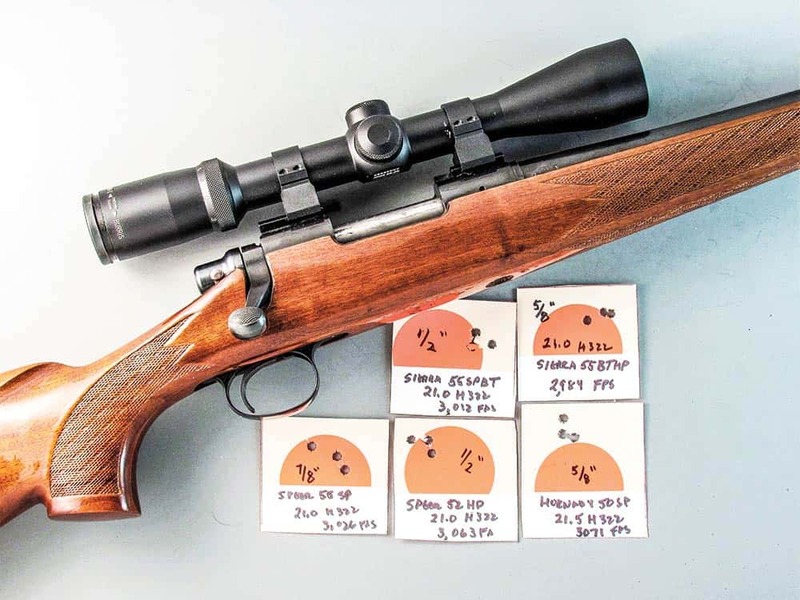 The .222 also spawned three other cartridges — the shorter .221 Remington Fireball, the more powerful .222 Remington Magnum, and most importantly, the .223 Remington. Today it’s virtually all a .223 show. Finding a .222 rifle in a sea of .223/5.56’s guns isn’t easy but I find it very satisfying to be able to once again shoot the classic Triple Deuce which I so ignorantly let get away more than a half-century ago. I feel I have — in a small way — recaptured my long-lost youth. Sometimes things just work out right.